The What: General Cable has debuted the Gepco Brand HDC920P Plenum Hybrid Fiber Camera Cable at the 2014 NAB Show (Booth #C7708) April 7-10, 2014. 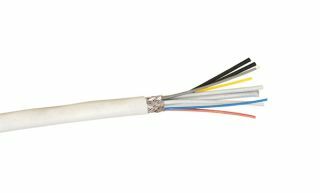 For permanent installation in plenum air spaces, the new HDC920P fiber optic and copper conductor hybrid fiber cable for SMPTE 311 applications features a flexible, white UL rated PVC jacket. The What Else: In the hybrid 311 format, the HD video signal is transmitted over two single-mode optical fibers to ensure accurate and extended-distance data transmission. To increase the durability, Gepco uses a special nylon-based polymer with increased tensile strength for the fiber coatings, and a 16 AWG steel strength member is cabled at the center of the cable core. All copper elements feature heat-resistant PE insulation and a shielded copper braid. The Lineup: The HDC920P joins the complete line of Gepco Brand SMPTE 311 hybrid fiber camera cables. The HDC920 comes in an extra-flexible, abrasion-resistant TPE compound that is ideal for portable, studio and outdoor broadcast applications, while the HDC920R comes in a riser rated PVC outer jacket for permanent installation. Designed for permanent underground installation, the HDC920PEF has an extra-rugged polyethylene jacket and water blocking tape wrapped around the cable core. Heavy-duty versions with a modified construction for rugged environments are also available.